All Woodfield Press artwork is created by Cindy. She uses pen and ink and watercolors to create her images. Her settings are taken from the New England woodland and coastal landscape and show her love of nature, gardening, and the animals that frequent her environment. 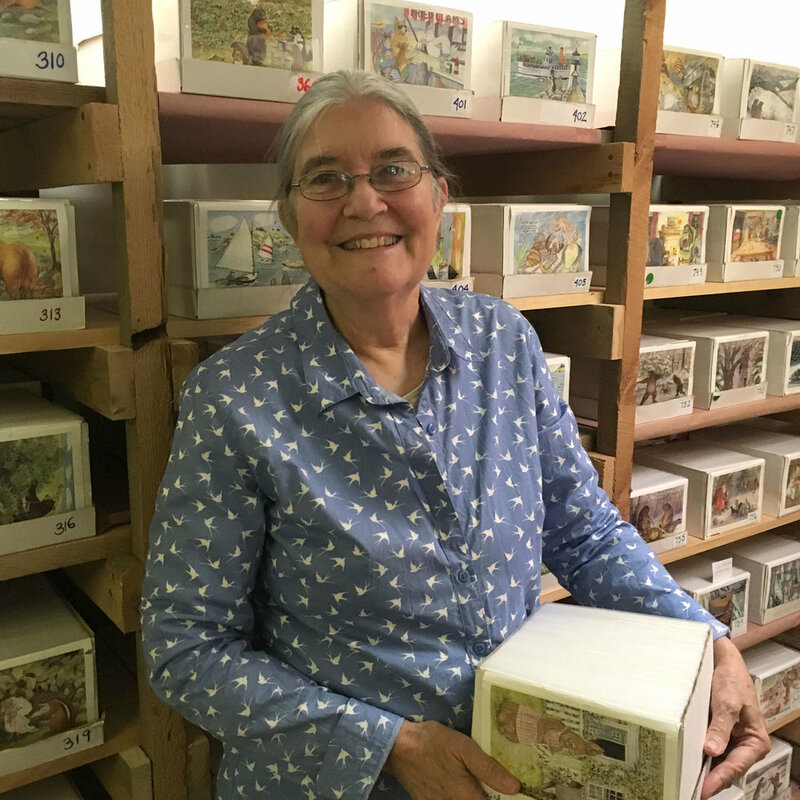 Founder and artist Cindy Hendrick formed Woodfield Press in Alstead, NH in 2004 with about a dozen notecards and two paper doll kits. The wholesale company has slowly grown and expanded to include Advent calendars, prints, coloring books, bookmarks, enclosure cards, seasonal and holiday boxed notecard sets, and most recently, magnetic notepads. In 2015, Woodfield Press became an LLC and although no longer apart of the day-to-day business operations, Cindy remains an active part of all major business decisions and continues to create new images for our products each year. Today, Woodfield Press merchandise is sold in about 450 stores throughout the US. The company continues to add more designs and products to its line each year. All products are Made in USA. Watch the video below to see our notecards being printed using a high-quality, state-of-the-art Heidelberg press right here in New Hampshire. There from the start, Peter helped get Woodfield Press up and running back in 2004 and still helps us behind the scenes today. Lark is our Inventory Packaging Specialist. She is a long-time employee who makes sure we never run out of product to ship. Erin is co-owner and manager of Woodfield. She loves her job! Peggy is our Trade Show & Social Media Coordinator, as well as a mighty-fine photographer!